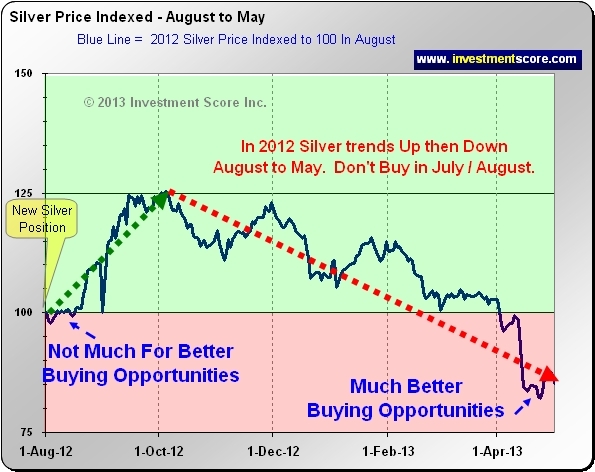 Are you invested in or looking to buy into the silver market? Back in April we wrote an article illustrating the seasonal trends for the price of silver. At that time we determined that it may make sense to wait for a more favorable time of year to buy new positions. 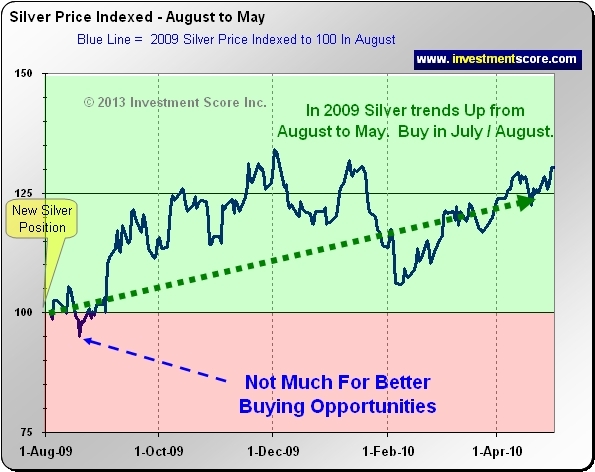 Based on silver performance in past years, would it have made sense to buy in July / August, or would it have made sense to wait for a better buying opportunity? Let’s take a look at some purchases in the bull market at the start of each August to see what would happen to that investment by spring. 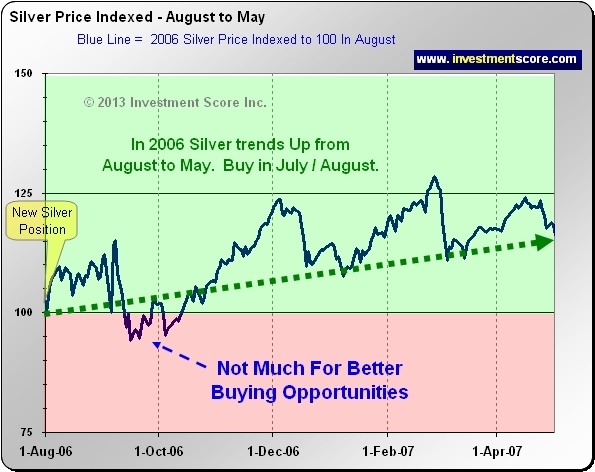 In 2004 we can see that if we had purchased silver in August we would have had a little bit of buying opportunities in the coming months but not much. Silver more or less trades sideways to slightly up that year but July / August was a reasonable time of year to add to positions. So how about the other years? In 2005 we can see that July / August was a fantastic time to add to new positions. A strong uptrend followed the typically slow summer months. 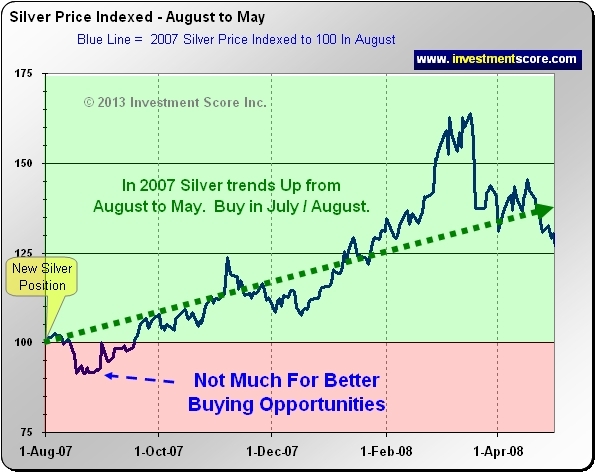 In 2006 a slightly better buying opportunity presented itself in September / October which can typically be another weak time of year for the price of silver. However, July / August proved to be a reasonably good time to add to positions in 2006. 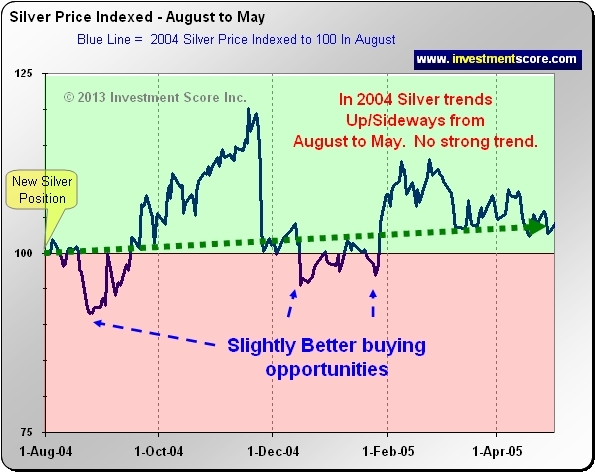 In 2007 the price of silver trended much higher from summer to spring with the exception of a slightly better buying opportunity around September. Again, buying in July / August turned out to be a lower risk buying opportunity. 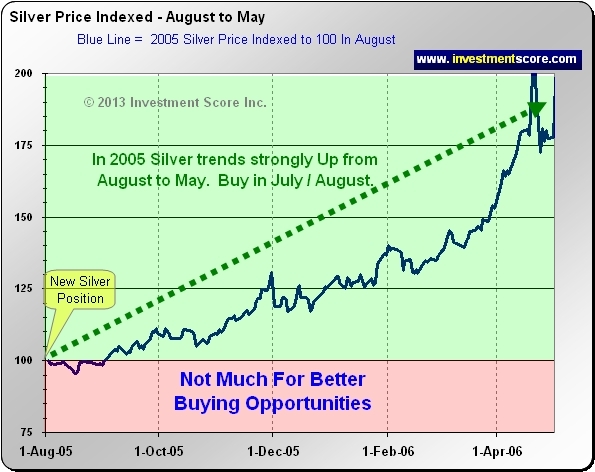 Clearly buying silver in July / August of 2008 was not a good idea. It made a lot more sense to wait to purchase the metal at a considerably lower price in October. 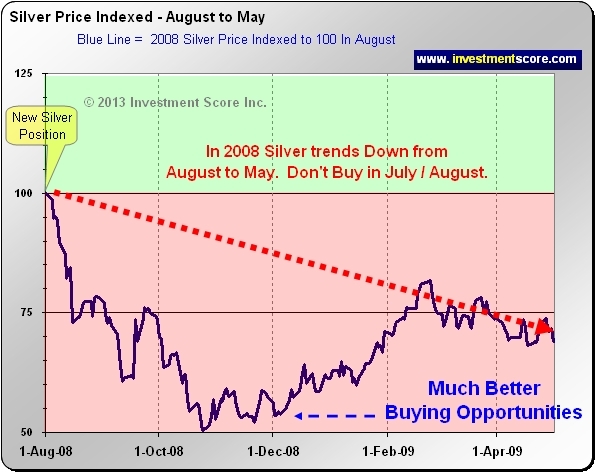 Now buying new silver positions in July / August of 2009 & 2010 was a fantastic time to buy silver. In fact, waiting to buy new positions in October could have resulted in missing this impressive uptrend. 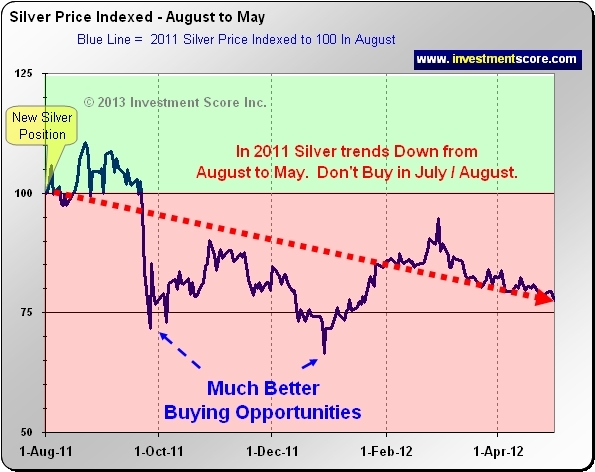 In the strong downtrend of 2011, following the strong advance in 2010, August 2011 proved not to be a great time for buying silver. 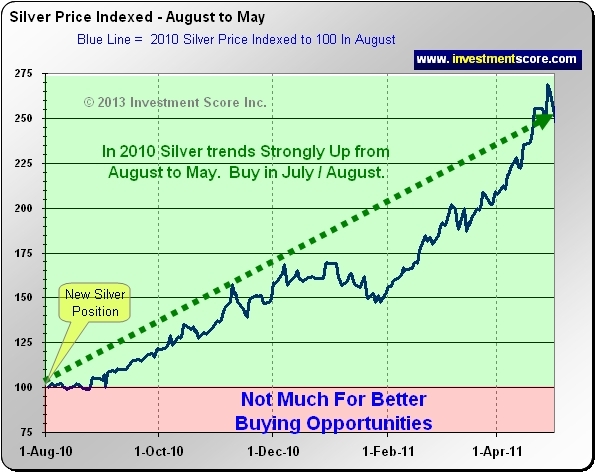 From a short term perspective it would have been a very bad idea to buy silver in October of 2012. Summer is a great time to add to position as it is often at or near the low for the year. When taking new positions in summer one must realize that even lower prices often present themselves in fall. After a strong year with a large increase in the price of silver it is possible that prices do not shoot higher and can actually fall further heading into spring. It is important to consider the market from many perspectives prior to buying but seasonal trends are a very helpful tool to consider. What is interesting from the above analysis is just how well an investor could have done from 2004 to 2012 just from buying at the start of August and selling at the end of April. This is a rather simplistic trading strategy that could have made an investor, excluding fees and taxes, approximately a 31% compounded rate of return. Legal Disclaimer: No content provided as part of the Investment Score Inc. information constitutes a recommendation that any particular security, portfolio of securities, transaction or investment strategy is suitable for any specific person. None of the information providers, including the staff of Investment Score Inc. or their affiliates will advise you personally concerning the nature, potential, value or suitability or any particular security, portfolio of securities, transaction, investment strategy or other matter. Investment Score Inc. its officers, directors, employees, affiliates, suppliers, advertisers and agents may or may not own precious metals investments at any given time. To the extent any of the content published as part of the Investment Score Inc. information may be deemed to be investment advice, such information is impersonal and not tailored to the investment needs of any specific person. Investment Score Inc. does not claim any of the information provided is complete, absolute and/or exact. Investment Score Inc. its officers, directors, employees, affiliates, suppliers, advertisers and agents are not qualified investment advisers. It is recommended investors conduct their own due diligence on any investment including seeking professional advice from a certified investment adviser before entering into any transaction. The performance data is supplied by sources believed to be reliable, that the calculations herein are made using such data, and that such calculations are not guaranteed by these sources, the information providers, or any other person or entity, and may not be complete. From time to time, reference may be made in our information materials to prior articles and opinions we have provided. These references may be selective, may reference only a portion of an article or recommendation, and are likely not to be current. As markets change continuously, previously provided information and data may no be current and should not be relied upon.